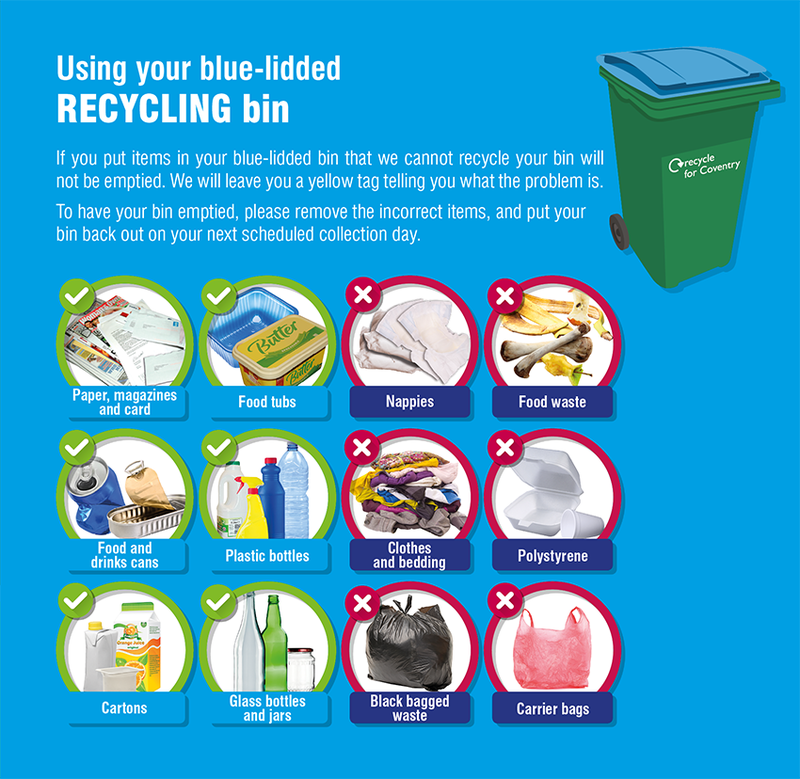 Your recycling bin is collected every fortnight - to find out when your collections are, please find your street in our directory. Please note that your bins will not be collected if rubbish is compacted, bin lids can’t close or bins are too heavy to safely be collected. Please do not put plastic bags in your bin. If your bin has not been collected you should have received a bin tag informing you of the reasons why this has happened. If your bin has not been collected and you have not received a bin tag please visit the missed bins page to report it. What can I put in my blue-lidded bin? All household food tubs including fresh fruit and meat trays etc. Plastic carrier bags are made from a range of different plastics. The carrier bags can shred during the sorting process and end up in with the wrong type of plastic (contaminating the load). They can also become tangled around the sorting machinery which leads to further problems. Many larger supermarkets have recycling facilities for plastic bags. We would advise residents to only shred the part of the document that contains personal/sensitive information and dispose of this in the green lidded bin, alternatively it can be used for animal bedding or home composting.